A monumental women’s triple jump final here ended with Colombia’s 33-year-old world and Olympic champion Caterine Ibarguen being deposed by her exuberant 21-year-old rival Yulimar Rojas, who thus claimed Venezuela’s first gold in the history of the International Association of Athletics Federations’ World Championships here. The intensity of the battle between these two athletes is best expressed by the way in which the lead switched between them. First round, Ibarguen jumps 14.67 meters. Second round, Rojas jumps 14.82m. Third round, Ibarguen jumps 14.89m. Fifth round, Rojas responds with 14.91m. As the defending champion’s final effort was revealed as being 14.88m, Rojas – who took Olympic silver behind the Colombian at Rio 2016 – turned into a jumping jack as the realization that she had finally bettered the woman who has been virtually unbeatable since taking silver in this Stadium at London 2012 sank in. “I am so proud about this gold medal,” said Rojas. “My family, my friends and my country – I made them proud and full of joy. “I am sure they will be celebrating and having a party. “Yes, the last attempt of Ibarguen was hard for me. Ibarguen offered a brief embrace before exiting stage left. 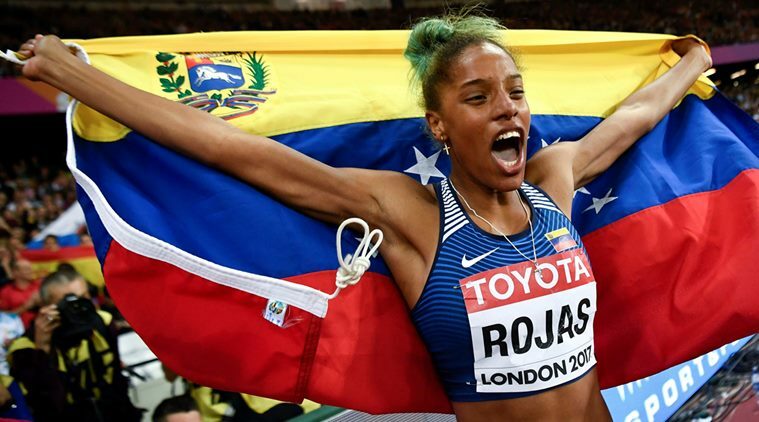 Finally, It was the moment for Rojas to take center stage after delivering what was only Venezuela’s second world medal following last night’s shared bronze in the pole vault through Robeilys Peinado. Meanwhile, Kazakhstan’s Olga Rypakova, who denied Ibarguen Olympic gold here five years ago, was celebrating a bronze medal thanks to a season’s best of 14.77m. Poland’s Anita Wlodarczyk, whose 32nd birthday is tomorrow, helped herself to an early present as she claimed a third world title in the women’s hammer to add to the golds secured at the last two Olympics – despite having a finger injury. “I injured my finger during the first training session in London and it was quite painful,” she revealed after winning with a best of 77.90m that was some way down on her world record of 82.98m. “And I started to have cramps tonight. “So it was not easy and I am very angry about myself. Wlodarczyk, who admitted she had been nervous about her injury, took a little time to find her range in the – but once she threw 77.39m in round four it was game over, and she improved again in round five. China’s Wang Zheng, with a 2014 personal best of 77.68m, made a huge effort to catch her with her final throw, confirming her silver medal position with 75.98m. Bronze went to Wlodarczyk’s compatriot Malwina Kopron thanks to her first-round leading effort of 74.76m. Defending men’s triple jump champion Christian Taylor required just one leap to qualify for the final on Thursday (August 10), reaching 17.15, 15 centimeters beyond the automatic qualifying mark and the second furthest of the night behind the 17.20m registered by team-mate Chris Benard. The third US contender Will Claye, Olympic silver medalist behind Taylor at London 2012 and Rio 2016, progressed with 16.95m, with Cristian Napoles of Cuba being the only other automatic qualifier with 17.06m.